John and Susan Warshawsky became acquainted with the MU College of Veterinary Medicine when they were students at Mizzou in the early 1980s and took in a cat that needed medical care. They have continued to support the college with a monthly gift. “While my wife and I have been away from Missouri for more than three decades now, we very much consider ourselves products of Missouri,” says John Warshawsky, speaking from his home in Baltimore, Maryland. John and Susan were St. Louis kids, children of fathers who worked for McDonnell Douglas, an aerospace and aviation giant then based at Lambert Airport. Their fathers worked in the same office, but their children didn’t meet until they were University of Missouri students in the mid-1970s. 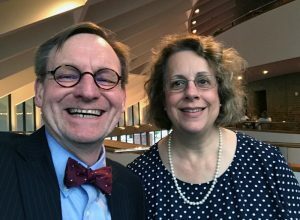 They married in 1979, the same year they returned to Columbia, so John could attend MU’s School of Law. During that time, Stanley entered their lives. “We had moved into an apartment where there was this cat, who was kind of the apartment-complex cat,” Warshawsky says. “He lived on the street and just kind of bounced from unit to unit; he didn’t live with anybody in particular. In my second year of law school, I was selected to be the managing editor of the law review the next year. It was a great experience, but a lot of work. I was coming home late, like 2 or 3 in the morning. This was probably February or March of ’81, and it was really cold. The cat was out there, so I invited the cat to come in and spend the night with us. We let him out the next morning because, again, he was the complex’s cat. But, he became a nighttime visitor to our apartment. 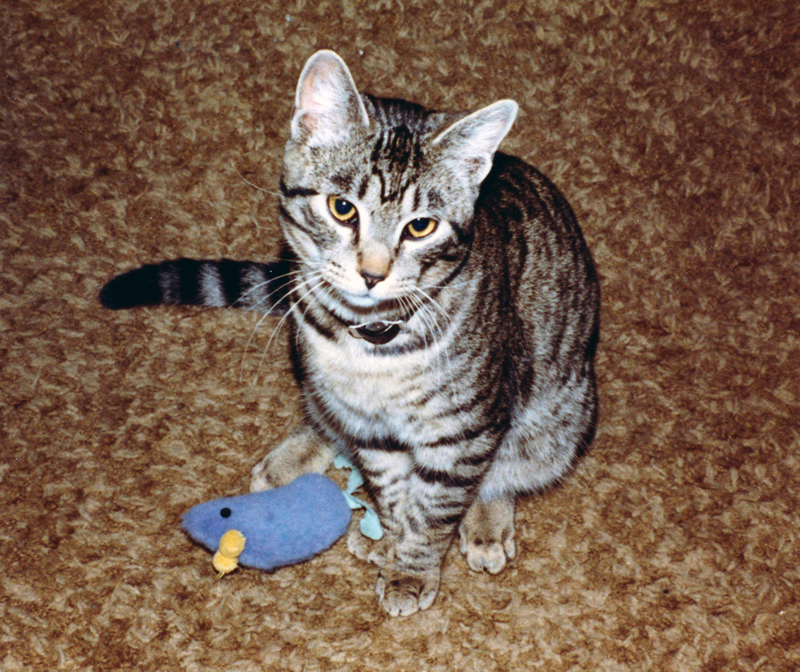 Stanley was the Warshawskys’ first cat. They made their first gift to the CVM in his memory when he passed away in 1994. “We lived on the second floor,” Warshawsky continues. “One evening, Susan was home at the time, that little cat dragged himself up the stairs to our apartment. He had been injured somehow. We don’t know if he was hit by a car, or what, but the ball-and-socket joint of one of his rear legs had been shattered. Stanley was later joined by Ernie, a cat adopted from what is now the Central Missouri Humane Society. 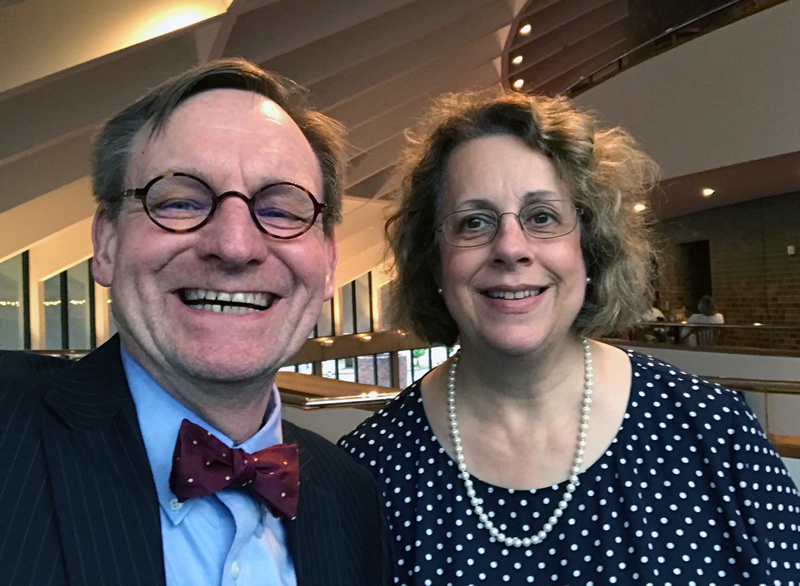 After John graduated from law school in 1982, he, Susan, Stanley and Ernie moved to Washington, D.C., with John working as an attorney at the U.S. Department of Justice, and Susan as an accountant at Georgetown University. After Stanley and Ernie passed away, new companions joined the Warshawskys: Max and Juma. “We got two more rescue cats from the Humane Society in Washington, D.C.,” Warshawsky says. “Max and Juma lived good lives with us before they passed away, Max first, and then Juma in late 2014. Then we adopted our current cat, Ruby, again from the Humane Society in D.C.
As it turns out, John was not just a lover of cats. He was in love with the city of Baltimore. Yet, relocation — even one as cheery as this one — can have its challenges. 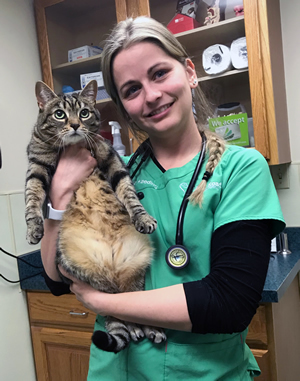 When the Warshawskys relocated to Baltimore, Maryland, in 2018 they searched for a new veterinary clinic to provide care for their cat, Ruby. They chose a practice with a CVM alumna on the team, Amelia Kaeding, DVM. “I’ve seen Ruby a couple of times; she’s still a young cat and pretty healthy,” says Kaeding, DVM ’17. There can be little doubt that the Warshawskys remain true to their school. “We are so appreciative of what the University of Missouri has done for us over the years, what it has made possible for our lives, and we’re very appreciative, obviously, of the vet school,” Warshawsky says. “Toward the end of Stanley’s life, he developed a condition that was something like an inflammatory bowel issue. Mark Hitt was the veterinary specialist who cared for him. Dr. Hitt had done a residency in veterinary internal medicine at Missouri in the ‘80s. When our cats have needed care, we’ve been able to get them the care they needed. It all starts with a great veterinary school that can produce really excellent doctors. Mizzou Giving Day will be held from noon March 13 through noon March 14, 2019. Giving Day will include a variety of challenges between schools and colleges within the MU system. You can join the Warshawskys, and go all in to support the Veterinary Health Center’s lifesaving work or other College of Veterinary Medicine needs by making a gift of your own.